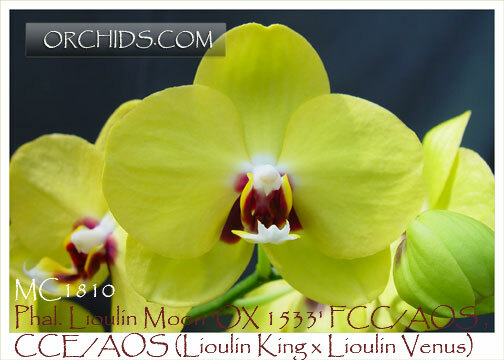 A spectacularly exquisite yellow harlequin, this clone reflects the best of today’s cutting-edge breeding ! 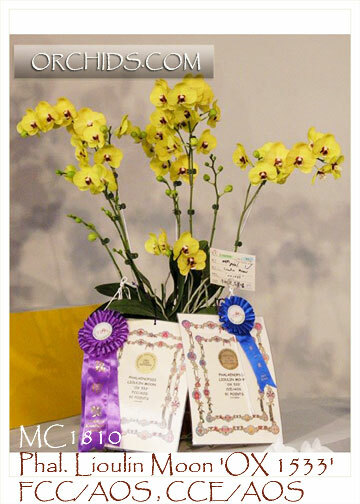 Awarded the highest flower award, an FCC/AOS from the American Orchid Society at the 2012 TIOS Show, it also garnered a Certificate of Cultural Excellence, the highest accolade possible for exceptional culture. When awarded, this clone was glowing with 68 flowers and buds beautifully presented on 8 inflorescences arising from a four-crown plant. Its 7.5 cm. brilliant yellow flowers were accented centrally with a bold rich mahogany ring around the column, creating the ultimate impact for a yellow harlequin. New and limited first release of this amazing clone !